Savvy RV-12 builders following the Blog may have noticed the gear legs on the DOG Aviation RV-12 were not primed … even though the gear legs are just about the only component on the RV-12 that Van’s assembly instructions make a special note in bold print informing the builder to MAKE SURE the gear legs are primed with a high quality primer, preferably epoxy primer. During the late fall massive primer session for the finishing kit parts, the gear legs were overlooked because they were at the bottom of a crate with cardboard over them …. out of sight, out of mind. 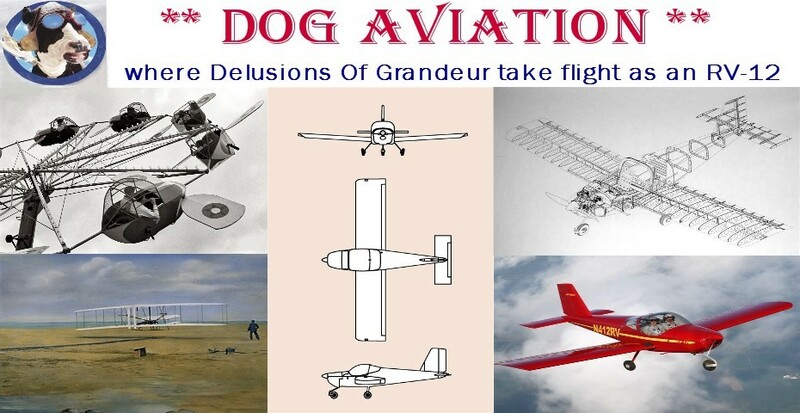 This oversight was not noticed until it was time to install the gear legs so the decision was made to continue moving forward and deal with it later …. and later would be now. Because the gear legs are showing signs of the beginnings of corrosion, as can be seen in the photo below, felt it would be best to make it right during the condition inspection. The beginnings of surface corrosion can be seen because of the lack primer on the gear leg. Priming the U-1220 gear legs is called for in the plans … Van’s recommends an epoxy primer as a first choice. The corrosion developing on both gear legs looked pretty much the same as this right main gear leg. Removing the main gear legs involves removing the wheel and axle/brake assembly. Decided to take a short cut and not remove the brake lines from the calipers. This was accomplished by removing the wheel nut after removing the two bolts that secure the outboard brake pad … this allows the wheel/rotor assembly to be removed from the axle leaving the caliper and inboard brake shoe attached to the axle assembly. After the wheel was removed from the axle, a thick paint stir stick (the thick type used to mix 5 gallon pails of paint) was quickly used as a substitute rotor and the outboard brake pad was bolted back on finger tight. The reason for placing the thick paint stick between the brake pads is to prevent the brake piston in the caliper from popping out of the caliper and creating a huge mess of brake fluid everywhere. Felt this would be a good idea because the brake assembly will be off the gear legs for a few days, so didn’t want any unexpected surprises similar to what a friend experienced with his airplane’s caliper piston popping out overnight and draining all the brake fluid onto the floor of his hangar. My finger is pointing to the paint stick placed between the two brake pads to prevent the piston from popping out of the caliper during the extended time the brake assembly will be off the aircraft. After removing the axle assemblies from the gear legs, each gear leg was easily unbolted from the center channel and removed. The gear leg removal was a piece of cake … (but the same could not be said when it came time for reassembly). The corrosion on the gear legs was cleaned up by soaking the gear legs in Alumiprep 33 which is basically phosphoric acid with cleaners formulated to clean aluminum. Long time readers of the DOG Aviation Blog may recall Alumiprep 33 was also used when preparing all the wing ribs for primer. Because the surface of the gear legs are not perfectly smooth, a brass wire brush was used to help clean down into the pores of the metal. In addition to being a product to clean and prepare aluminum for priming, Alumiprep 33 is also a great product for helping to remove surface corrosion on aluminum. 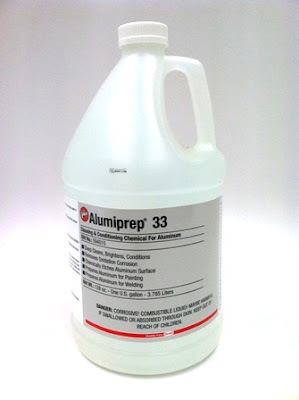 After using Alumiprep 33, it is necessary to give the parts a good rinse with water. Although not called for, I used distilled water for the rinse water. Unfortunately, after using Alumiprep 33 and rinsing the parts off really well ... as soon as the parts are dry, they need to be primed immediately. This made for a long work session by the time all the spray gun cleanup was completed. Both U-1220 main gear legs freshly primed with Akzo epoxy primer and ready to reinstall. Reinstalling the gear legs was a total fight … not fun … in fact, it was a pain in the neck both literally and figuratively. The difficulty stems from lack of access. When the gear legs are first installed on the RV-12 access is good because, in addition to the access hole in the belly skin, the F-1275G cover plate is not installed yet. Without the cover plate in position, the gear hardware is easily accessed with both hands. However, after the main gear legs are installed, the left and right F-1275G cover plates are riveted onto the fuselage leaving only a tiny slot for the gear legs to pass through. Photo of the F-1275G cover plate … this plate is not riveted in place until after the gear legs are installed. As one can see from the photo, when the F-1275G cover plate is riveted in place, it eliminates all access for a second hand to reach the gear leg mounting hardware. This is one area where I feel using nutplates to secure the F-1275G cover plate would have been a great idea …. but in reality, once the main gear legs are installed, there is no need to remove them on a regular basis. That said, having the F-1275G cover plate secured with screws would sure make checking the bolt torque much simpler. The lack of access created a huge problem dealing with the U-1202 outer attach bracket and associated bolts … this is because only one hand barely fits into the inspection hole on the belly of the airplane making it seemingly impossible to hold the bracket (which is about 6" or so further in from the access hole) and install a bolt at the same time all with one hand. After fighting and fighting with the hardware inside the center channel for a very very long time and exhausting my entire dictionary of choice cuss words, Bernie came up with a brilliant idea that was simple and truly worked quite well … once we learned the “how to”, quick progress was made. Bernie suggested sliding a wooden dowel rod or brass rod into the gap between the gear leg and fuselage skin to hold the bracket in place so the mounting bolt could be inserted. This worked out great! As an example, I could roughly position the U-1202 attach bracket and Bernie inserted the rod to hold the bracket in position so I could let go of the bracket and free my hand for inserting a bolt into the bracket and subsequently up into the center channel. This method also came in handy when torqueing the bolts on the attach bracket … I could not see the bolt when my hand was in the access hole, so I would hold the socket end of the torque wrench so I could feel it slip onto the bolt then Bernie reached in with the rod and pushed up on the torque wrench to keep it in position on the head of the bolt while I repositioned my hands to the handle to begin torqueing the bolt. Bernie’s idea of inserting either a brass rod or dowel rod through the gap adjacent to the gear leg and pressing up on the U-1202 bracket or the torque wrench to free my hand for a few moments worked great. With both main gear legs now reinstalled, bolted and torqued down ... the axle, caliper and brake assemblies were reinstalled on the gear legs. Decided to switch the wheel bearing grease to a full synthetic grease so the wheel bearings were washed in mineral spirits (akin to Stoddard fluid) and blown out with compressed air. This was repeated three or four times until the bearings were spotless. I would caution fellow builders not to let the bearings spin when blowing them off with compressed air …. it is always a temptation, but it is truly not good for the bearings. After hand packing the bearings with fresh full synthetic grease, the wheels were placed back on the axles. The following was mentioned previously in the Blog the first time the wheels were installed ... but bears repeating. The wheel assemblies used on the RV-12 are manufactured by Matco. The wheel bearings supplied by Matco for the wheel assemblies used on the RV-12 ARE NOT the typical automotive wheel bearing so the procedure for tightening the axle nut is different. On a car, the axle nut is tightened until there is a slight drag placed on the wheel bearings then the axle nut is backed off a little and locked in place with a cotter pin. This method will not work for the Matco wheels used on the RV-12 because the bearings used by Matco have a built in grease seal. The procedure for tightening the axle nut on the Matco wheel is to tighten the axle nut while slowly rotating the wheel … all the while looking at the grease seals. The grease seals will spin with the wheel until such time as there is sufficient pressure applied to the bearings by the axle nut that the pressure prevents the grease seals from spinning when the wheel is rotated. This is UNLIKE a car wheel because the axle nut IS NOT backed off from this point. In fact, if the cotter pin won’t drop into one of the holes in the axle, the axle nut is TIGHTENED a little further until it does. The result is not a free spinning wheel, but one that has a little bit of drag … this is fine, because the bearings are designed this way.